As waters begin to cool on all of Alabama’s lakes, many would-be anglers are finding their duties elsewhere are keeping them off the water. Holidays, deer season and hunting in general, past times such as watching football and for some, just trying to stay warm – like when chopping wood for the winter becomes a real necessity. That leaves a lot of water on Alabama’s 5,850 acre Mitchell lake for wintertime anglers to fish – in somewhat of a solitude setting. Although Mitchell Lake (the fifth lake in a series of six Coosa River Impoundment’s), is unseasonably low for winter pool (it is usually close to full pool year round) and Mitchell lake is somewhat of small lake when compared to other Alabama impoundments, there is still plenty of water to explore this winter. Even major feeder creeks (at full pool displaying 20 foot depths), still have plenty of both spotted bass and largemouth bass that can be very cooperative. That is, when you are fishing during the right conditions on the right days. Like any impoundment Mitchell lake has its good days and its bad days. Often and more times than not, the weather dictates the way your fishing day is going to be. Most of the time (very cold nights in the upper teens and low twenties) coupled with daytime highs not even reaching 50 degrees can be downright miserable and staying home is smarter. Including, it can be a day when only a few scattered bites make up an entire day of searching for bass out of the high winds and often it can be a cold, cloudy day. Tournament days on Mitchell lake go even faster and before you know it your fishing day is at an end usually around 3 p.m. So making the best of your day, being in the right place at the right time and making the correct fish catching decision is very important to your fish catching success. Most of these online fishing reports consist of, (for instance) Well, we went out this week on Lake-What-a-Hog and we were fishing some “big bass lures” in such and such water depths and we just literally slayed em’ on what just happens to be my favorite sponsors lures and ironically their best selling colors! Of course you have got to have the new $1000.00 rods I use and the new, one and only $1000.00 reel as well. These are made by my sponsors too! And that’s OK. But it does you no good. Conditions change daily. That gets us back to the weather, fishing locations and most importantly whether your fishing on a week day or a weekend on Mitchell lake. So here’s one likely location you can explore all throughout this winter season on Mitchell Lake; Mitchell Lakes Headwaters. When being in the right place, at the right time, fishing the right lures during the right conditions…is what it takes to fool Mitchell Lake’s bass. Low water. That is not good for any angler, whether or not an angler is in a shallow draft aluminum boat or when one is navigating a shiny, new $50,000 bass boat. Extreme caution must be used in these Mitchell lake headwaters, which is situated just below upper reservoir, Lay Lake dam. During low water (wintertime pool levels), these rocks are just under the waters surface. Boulders that are normally just a few feet under the waters surface are reasonably safe to idle your boat around, that is when the lake is at full pool. But with Mitchell lake now down anywhere from 2-3 feet, a lot of these previously submerged rocks and boulders are now either protruding above the waters surface near the dam, or some rocks are now dangerously hidden just inches under the waters surface. Just waiting for some unfortunate angler to bang a boat into, causing boat damage, motor damage or worst yet putting lives at stake. So having said that, if you have ever fished Mitchell lakes headwaters then you know about idling down your boat at the last island, right before seeing the dam. Gilchrist Island (Airport island) sits right below a bridge in Mitchell lakes headwaters. You will see Lay Lake dam about a half mile ahead. As for you experienced anglers (a reminder), or for anglers new to navigating their boats in Mitchell Lakes headwaters, this means running the boat up the left side of this island as usual. Upon seeing the bridge slow down to an idle and stay close to the left side of the lake, close to the middle of the bridge, but away from the long, upper Airplane island point, it runs way out towards the bridge pilings. Just above this bridge, using the trolling motor is suggested, as you near the main lake point obviously sticking out on your left, just below the mouth of Yellowleaf creek. From here to the dam (excluding the dam discharge area and a few deep holes), the water is only 1-3 feet deep. The current can be swift at times in these lake headwaters, so bringing an anchor is highly suggested. There are very few places where an angler can escape the current and the batteries on most of today’s boats, no matter how new they are, could be drained by mid day, especially if the current is evident all day. Anchoring down the boat does have its good points and its drawbacks. Anchoring down a tournament boat with the trolling motor in the “stowed position” is a good way to claim a spot. 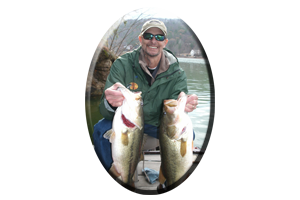 Most tournament rules specify an angler can claim a spot when fishing in this manner. It is common courtesy for other tournament anglers to stay at least 50 yards away or anchor down and claim their own spot! Some anglers may not like it, but as they say, “that’s the rules.” I always carry an anchor and a long 50 foot rope for anchoring down. You never know when you are going to need it! Besides anchoring down your boat in these swift, lake headwaters claiming a spot during bass tournaments, there are other advantages to having an anchor. For one, it does make you thoroughly fish a spot, not getting off course when trolling all around in the current and concentrating on your lure presentation. It also keeps the boat stationary and you can easily cast upstream bringing your lures with the current in the right manner, while not having to deal with the wind, current and trolling motor. All fish face into the current, they are looking for an easy to catch meal in these current laden, Mitchell Lake headwaters. Usually these meals are washed their way as they stay hidden down below in ambush spots just out of the current. Minnows, shad of all sizes, bream, crayfish, worms, fresh water eels and other prey all live in these lake headwaters. They are all susceptible to being ate by Mitchell Lakes predator fish such as spotted bass, largemouth bass, white bass and striped bass. So your lures should simulate these prey in shape, size, color and even lure action. The disadvantages of anchoring down the boat is hanging up lures fished on or near bottom. Hanging up costly lures means either breaking them off or pulling up the anchor and having to go after them. Remember time is money in bass tournaments. Doing this 5 – 6 times alone means at least 30 minutes of your tournament day is gone wasted on retrieving hung lures, instead of enticing bass to bite. So beforehand, whether your in a bass tournament or just plain fishing discuss hanging up your lures with your partner to avoid this problem to start with. Lures that will not hang up can be many when fishing in 1-3 feet of water. Although winter is not thought of as topwater lure season ask any angler and most will exclaim they have seen schooling bass in these Mitchell lake headwaters and most anglers have managed to fool a few bass even in low 50 degree water temperatures. So always have two rods rigged, one with a large topwater lure and another rod rigged with a smaller topwater offering. 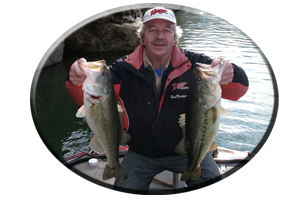 The same goes for your fishing partner, who may be experimenting with various topwaters, different colors or even topwaters with qualities such as prop-baits, cup-faced topwaters or walking type topwaters. You can fish most topwaters with 14-20 pound test line in these lake headwaters. Long rods and wide spooled reels allow for longer casts with less frustration. Sharp hooks are a must, for many bass just slap at the lure missing it, if it is not sporting very sharp or newly replaced hooks. Another topwater lure or one that can be fished weightless is a soft jerkbait. Line test of 10-14 pound test is suggested to get these not-so-wind resistant weightless lures out there. Adding nails or rattles to the center, head or tail of a soft jerkbait, will cause these soft jerkbaits to slowly sink and allow for better casting distance with more weight. Going to a bigger hook or fishing a thick-shanked hook, also adds needed weight to soft jerkbaits. You can also fish these lures with a sharp jerking motion keeping it on or near the water’s surface. Or you can dead stick them or allow them to slowly sink while feeling for a strike. Other lures in this weightless category are slowly sinking plastics like Gary Yamamoto’s Senkos or Zoom’s trick worms. Even wacky rigging soft plastics fools bass that may ignore all other lures and presentations in these oftentimes very crowded lake headwaters. To avoid hanging up in these lake headwaters calls for the use of many other types of lures. 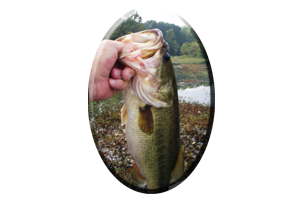 Spinnerbaits will not hang as much if you pay attention on every cast and choose your spinnerbait weights according to the swiftness of the current. 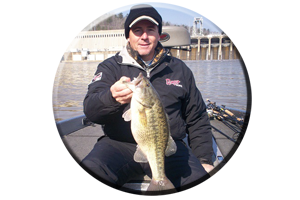 You can slow the spinnerbaits fall using bigger blades, gaudy trailers, or heavier line. Long rods and heavy 17-20 pound test line are suggested. Shallow running crankbaits, especially square billed crankbaits are great for fooling bass, bass that other anglers fail to entice. Many meals in these lake headwaters look like a crankbait. Keeping your rod held high and giving a slight jerk when your crankbait careens off of a rock can avoid hang-ups. Floating or suspending jerkbaits are also weedless and really help avoid hang-ups while fishing in Mitchell lakes 1-3 foot of rocky, boulder-strewn lake head waters. Rattletraps or other rattling, lipless lures can be fished fast to avoid hang-ups or they can slowly be fished in a lift and drop fashion. Paying attention to what your lures are doing is a big part of either hanging up or learning to fish Mitchell lakes headwaters with less frustration. If you are just casting out your lures and allowing them to sink to the rocky bottom, then you can expect to hang up all day. If fishing lures along the bottom and planning on anchoring down, start with cheaper lures like small worms, lizards, grubs, shad imitations and crayfish plastics rigged on jig heads. Breaking off these lures is less costly and can be afforded by most anglers. Planning a trip to Mitchell Lake this winter season? Always call on Reeds Guide Service…first! 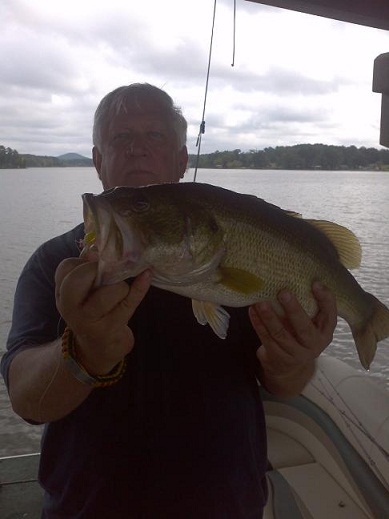 “Over 30 years exploring, tournament fishing and guiding on Mitchell Lake and other Alabama Lakes” Several guides available, year round, for multiple parties and corporate guided trips. Discounts available. 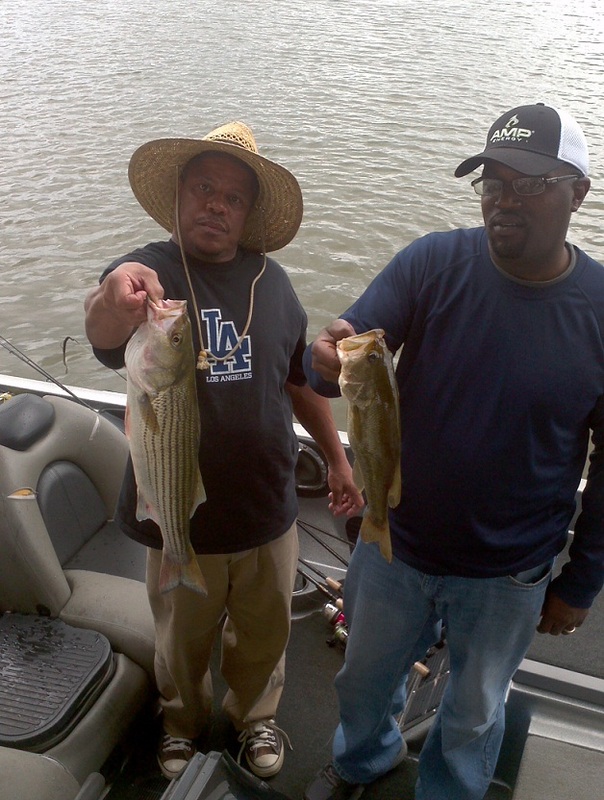 Tournament anglers welcome!